Heimars World: It's your day! Diese Karte hab ich grad für den aktuellen Challenge bei "A Spoon Full of Sugar" gewerkelt. Nochmal in blau-grün...da steh ich grad drauf*gggg. 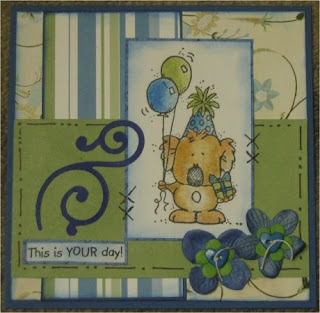 I just finished this card for "A spoon Full of Sugar". Once again with blue-green combination...I do like this colors in these days*gggg.